Are cities prepared for the growing threat? Global warming is causing oceans to rise at alarming rates, threatening coastal cities across the globe with flooding. 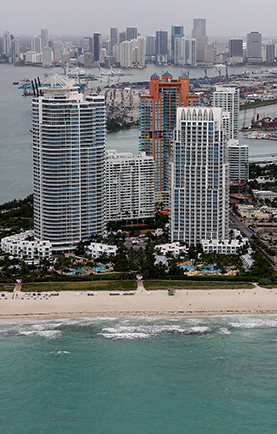 The East Coast of the United States is especially vulnerable, with Miami, New York City and Boston among the world's 10 most exposed metro areas. Scientists warn that under the most extreme scenarios, annual flooding worldwide could cause $1 trillion in losses by 2100 and submerge areas that are now home to more than 150 million people. But how much the seas will rise, and when, is unclear. Because of that uncertainty — and the popularity of waterfronts among developers and homeowners — cities are grappling with hard questions. How much sea level rise should they plan for, and how much time do they have? Should cities build expensive defenses or pull back from coastlines? South Florida is among the most aggressive at addressing sea level rise, investing millions of dollars in elevated highways, flood pumps and seawalls. In the Netherlands, engineers are devising ways to co-exist with rising tides, offering potential solutions that officials across the globe are studying.